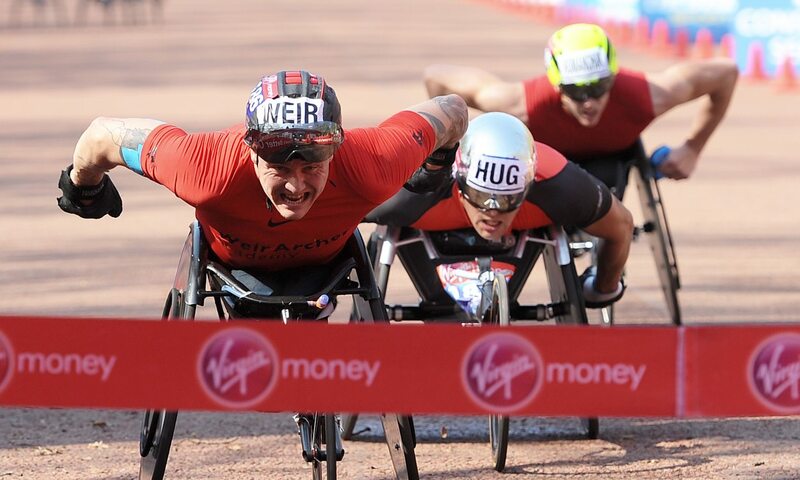 David Weir won his eighth Virgin Money London Marathon title, storming to another victory in a sprint finish ahead of Switzerland’s Marcel Hug on Sunday. The six-time Paralympic champion had described feeling like he had a “new lease of life” ahead of the race and the 38-year-old proved he still has the hunger as he roared over the finish line on The Mall, clocking 1:31:15 ahead of Hug with the same time, while USA’s 20-year-old Daniel Romanchuk was third just one second back. In the women’s race, Australia’s Madison de Rozario followed up her marathon win at the Commonwealth Games just a week ago with another victory, beating USA’s Tatyana McFadden as both athletes clocked 1:42:58. American Susannah Scaroni was third in 1:43:00. Weir, who retired from track racing last year, was contesting the event for the 19th consecutive time, after starting his career in the Mini London Marathon before that. “The end was tougher than last year,” said Weir, whose seventh win in 2017 had seen him surpass the previous record tally of six he shared with Tanni Grey-Thompson. “Mentally and physically I felt better coming into this. “I’m really happy this year. Last year I was in a different state of mind and I couldn’t really celebrate. Now my head is clear, I’m enjoying the training again, and the racing. I’m just enjoying life to be honest, and I think that’s what’s helping. Behind the top three, USA’s 2015 winner Josh George was fourth in 1:31:24 and Australia’s Commonwealth Games champion Kurt Fearnley fifth. Weir’s fellow British athletes JohnBoy Smith and Simon Lawson were 11th and 13th after their silver and bronze medal wins on the Gold Coast. While some athletes struggled in the heat, De Rozario enjoyed the conditions but still shocked herself with her victory ahead of McFadden, who was racing in vastly different weather to that in which she won the Boston Marathon on Monday. “I’m very surprised to be honest,” said the winner, who claimed T54 1500m and marathon titles on home soil at the Commonwealth Games. “We were all together for a bit and I didn’t think I’d have enough for the final sprint. Thanks to the girls who were in that race, that was amazing. McFadden had been forced to miss racing in London last year after surgery for blood clots and was glad to be back. “It was a really good race,” she said. “It’s hot today, which is so different from Boston in freezing conditions! That’s what’s fun in London, you never know what you’re going to get. 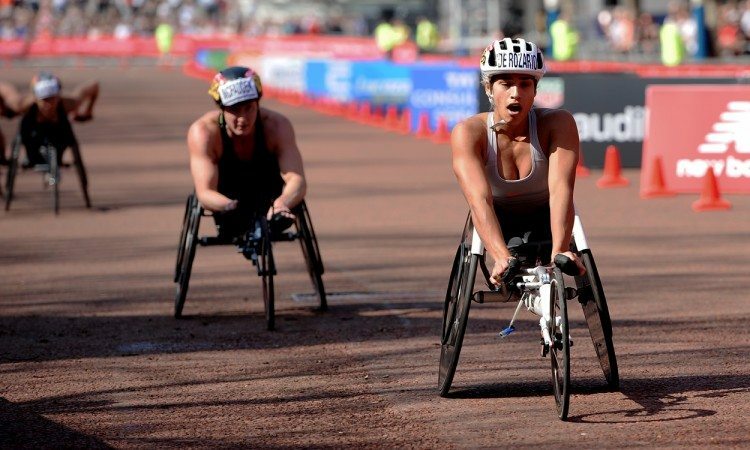 After her gold and bronze medal wins in the triathlon and marathon respectively on the Gold Coast, Britain’s Jade Jones finished seventh in 1:50:04. In the World Para Athletics Marathon World Cup, Britain’s Derek Rae won the T45/46 event in 2:36:13, while Alberto Suarez Laso took the T11/12 title in 2:28:49 as he returned to the city where he claimed Paralympic gold in 2012. Misato Michishita claimed the women’s title in 3:04:00. Weir secured the T53/54 title with his victory, while his fellow Briton Rob Smith secured success in the T51/52 category in 2:00:17.